As I watched the USA have a soul-crushing tie with Portugal yesterday, I realized how little I know about soccer. The “world’s most popular sport” may finally be taking hold in the American mainstream, but you, like me, probably know little about the rules of the game. Let’s learn a little more about the game together. 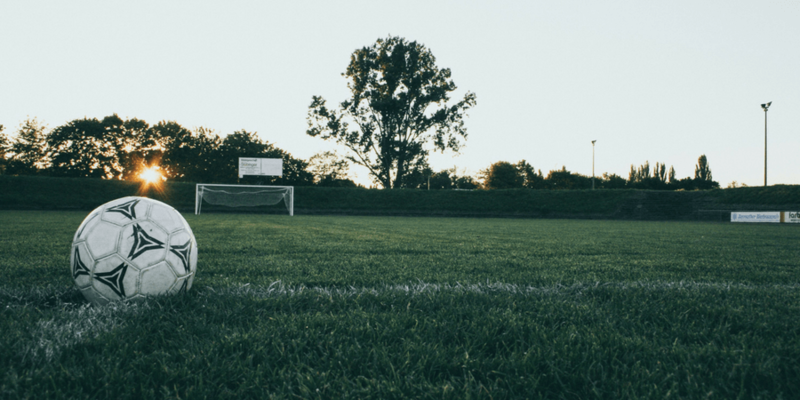 There are 11 players on the field for each team – two forwards, three midfielders, two wing-backs, two center-backs, a sweeper, and the goalkeeper (goalie) is the typical lineup but some positions may vary. Three substitutions are allowed per team per match and once you’re out you can’t come back in. The field is (usually) 100 yards x 50 yards. If the ball goes out-of-bounds there are a few different ways it can go back in. If it goes out on the touch-line (long side), the team who didn’t kick it out will throw it back in (throw-in). If it goes out on the goal line (short side) it will either be kicked in by the goalie (goal kick)- if the defensive team kicked it out – or kicked in from the corner by the offensive team (corner kick). The match consists of two 45 minute halves. Since the clocks never stop, extra time is added at the end of each period for time lost during substitutions, injuries, goal celebrations, etc. You win by scoring the most goals. It is most commonly one to five minutes but can be more. In soccer, however, a draw (tie) is an outcome that can happen in certain games. If the game does have overtime, it happens in two 15 minute periods. If after that those two overtime periods the game is still tied the teams play a sudden death of penalty kicks. If a simple foul is committed the ball is turned over to the team that was fouled at that spot. If the foul is considered a misconduct the referee doles out a yellow card. Two yellow cards = a red which means the player is ejected from the game. If their misconduct is particularly vicious, the referee can skip the yellow card and go straight to a red one. If a yellow or red card is distributed the player gets to do a free kick or penalty kick at the referee’s discretion. Though not technically a foul, a player can also get in trouble for being offsides. A player is offsides if they are behind the second farthest defender on the attacking side (the side where the ball is). If that player touches the ball then offsides is called which results in the other team getting a free direct free kick. A direct kick is when the player gets to kick the ball either to try to score or to pass without any defenders within 10 yards of him. Ten offenses lead to a player getting a direct free kick. These offenses are kicking, tackling, spitting, holding, tripping, charging, jumping, striking, pushing an opponent, or handling the ball. If any of these happen within the players own penalty box the other team gets a penalty kick (a kick only defended by the goalie). Did I get something wrong? Is there anything I should add to this post? Tell me in the comments!